Hope everyone had a great Thanksgiving! I enjoyed mine with family at my Moms house and have been enjoying the warm November weather we’re having. 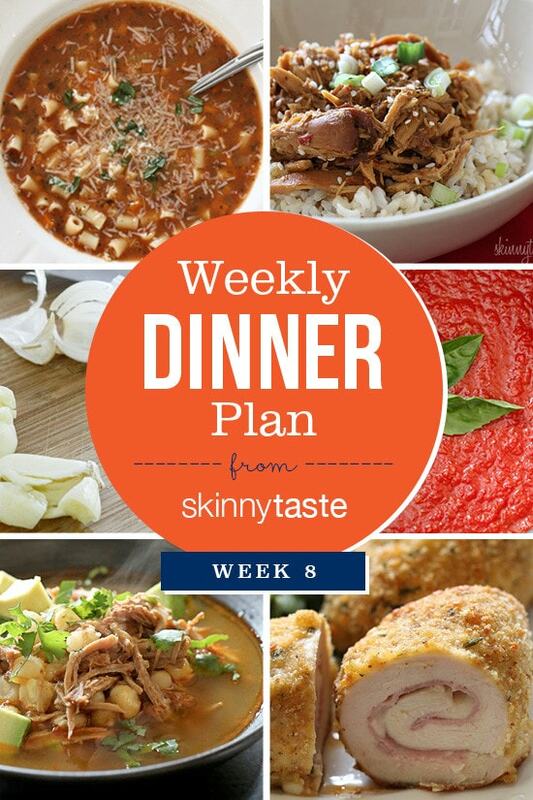 This is week eight (8) of sharing my weekly dinner plans since launching The Skinnytaste Meal Planner. I’ve had such positive feedback from all of you that I will be doing this every Sunday. you have an Instant Pot I would love to hear what you make in yours! I also started doing a running streak which I do every year after Thanksgiving. Today is day 2 of my #runningstreak. I am committing myself to run at least 2 miles every day until 2016. Who’s with me? And lastly, since this is the time of year when many of us pack on a few unwanted pounds, I wanted to let you know that Skinnytaste dietitian (and my close friend) Heather K. Jones will be releasing a free weight loss class on January 1st. Heather is dedicated to helping people succeed and she will help you transform your mindset about dieting to achieve weight loss freedom … no guilt, shame or self-hate required. Her loving approach is a game-changer in the world of weight loss. Go here to sign up for her free weight loss class, that way, once the holiday celebrations have ended, you can resolve to start the new year off right! I bought One and Done but it doesn’t show freestyle points. It says to go to the website to get them but when I search the website for white chicken chili with hominy, it says not found. Where am I supposed to look for the points? You can find this in the “Cookbook” tab of the website. Here is the direct link to the One and Done Cookbook Index. I am amazed by all the results by just following your diet plans. I love you for simplifying everything and make dieting way to easy. You seem to eat a lot of pork. I do not eat any kind of meat from the pig, pork or bacon. I do use turkey bacon, which I buy at Trader Joe's because of it's low salt content compared to other turkey bacons. I never ever cook with salt. I will serve salt on the side for those guests who would like it. However on the pork issue, would the points change a lot if I am using lamb, chicken, or beef. I am currently not a member of Weightwatcher's (can't afford it at this time)so I do not have access to their current point system etc. I am noting them down for tomorrow. Hope it turns out great because I will be home alone with no help from my mother! I'll add more of Parmesan cheese in replacement of Swiss Cheese. Works? I bought the InstaPot about a year ago and love it. Will be looking forward to some recipes for it from you. The book that came with it is severly lacking in recipes. I'm so looking forward to some instant pot tips! I have one, but haven't ventured into using it yet! 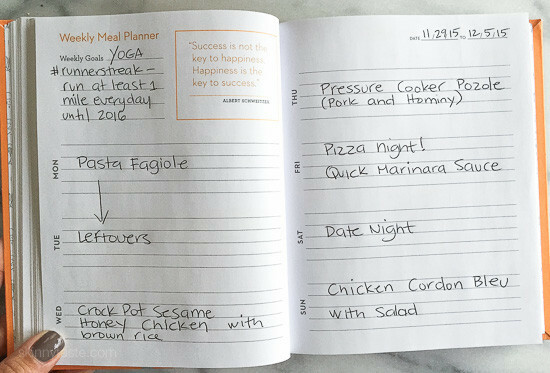 Need some ideas of meals in it that could also freeze, being single, I need to plan leftovers,…. I love my Instant Pot! Made a pot roast in it tonight and it turned out great. Gina, I would love if you could also include your sides. Have a hard time planning sides with each meal. Ok, will add next time. The House Salad With Love from my cookbook is usually a side a few nights a week. I love my instapot. I use it for whole squash, whole chickens, bone broth, steel cut oats, potatoes, rice! it cooks brown rice so well!, cheese cake, beans. I do truly love. I am not ambivalent about my pressure cooker! Love my instant pot! I made pasta fagiole last week. Was awesome. Also applesauce, cranberry sauce, other soups, steel cut oats, yogurt….. I hope you enjoy it too. I am looking forward to seeing what you come up with!!! Ooh, I might have to try steel cut oats! I made Pozole in my crockpot this past week…..I was hoping you had your recipe posted. Looking forward to your recipe. Huge thanks to you, Gina, for posting this every week! It has been an enormous help. And I love all of your recipes, haven't had a bad one yet! I can't run because my knees won't take the pounding but I do four miles on my exercise bike most days. The other days I go for a walk. Gina, I just went out and bought a Faberware pressure cooker, help! Now I need yummy recipes to use it. Any cook books you recommend? I checked out your pressure canner recipes, I hope you add more.